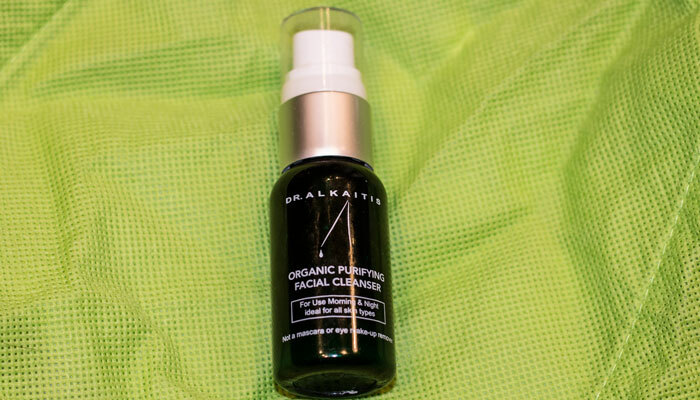 With its addictive herbal scent and low-foaming action, Dr. Alkaitis’ Organic Purifying Facial Cleanser didn’t last long around here — and that’s a good thing. Unlike many cleansers I test, Dr. Alkaitis’ Organic Purifying Facial Cleanser made it to “empties” status, and I’m a bit sad that it’s gone. This gentle, castile soap-based cleanser hooked me with its slippery-but-not-too-slippery texture that made it easy to apply and rinse. Most castile soap-based cleansers I’ve tried are way too watery; I typically end up wasting product, but not with Dr. Alkaitis Organic Purifying Facial Cleanser. 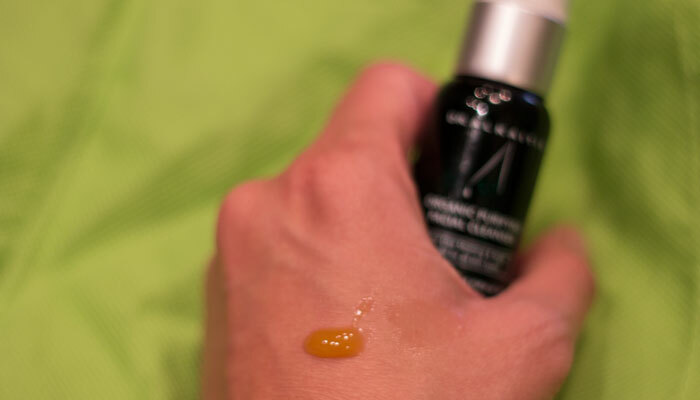 Instead, this organic face cleanser is thickened up just a bit with aloe vera gel and then pumped full of nutrients via Dr. Alkaitis’ own “Organic Herbal Skin Complex,” which adds major skin-healing benefits to this seemingly simple cleanser. Added into Dr. Alkaitis’ Organic Castile Cleansing Base (compounded from virgin, cold pressed organic Olive*, organic Shea*, Organic Jojoba*, organic Coconut*, organic Sesame*, organic Castor* and organic Borage* oils), the following ingredients are added: Organic Aloe Vera Gel *, Organic Herbal Skin Repair Complex (made up of Chamomile*, Plantain*, Black Elder*, Greater Nettle*, Myrrhº, Bitter Orange*, Rosemary*, Marsh Mallow*, Benzoinº, Marigold*, True Lavender*, Sea Wrackº and Atlantic Seaweedº), Vegetable Glycerin, Citrus seed extract, Natural vitamin A complex, Natural vitamin C complex, Natural vitamin E complex (D-alpha, beta, gamma, delta tocopherols), 100% pure Essential Oils. My oily, acne-prone skin responded well to the ingredients in this cleanser. During the time I tested it, I had a few active breakouts and with regular use of this (in addition to my trusty Zum Rub), my skin seemed to heal a bit faster and my face looked a bit calmer. I will admit, though, that my personal skincare philosophy doesn’t have me spending lots of money on cleansers. Because they stay on your skin for a short period time (rinsing money down the drain! ), it’s difficult for me to swallow the idea of paying $65 (or, hell, more than $25) for a cleanser that doesn’t do some sort of double duty (I’m thinking one that can also be used as a mask or mixed in with a mask). But, because my skin was so compatible with Dr. Alkaitis Organic Purifying Facial Cleanser, I could see myself repurchasing the travel kit (which is where this cute sample came from) and using it while I’m away from home, which is usually stressful on my skin. What’s your facial cleanser budget? Have you tried this cleanser? What do you like from Dr. Alkaitis’ line? Tell me in the comments section!